A. Rehabilitation and development of white cement plants in Falluja. The plant (which is the only one in Iraq that produces white cement) is not working at the present time. 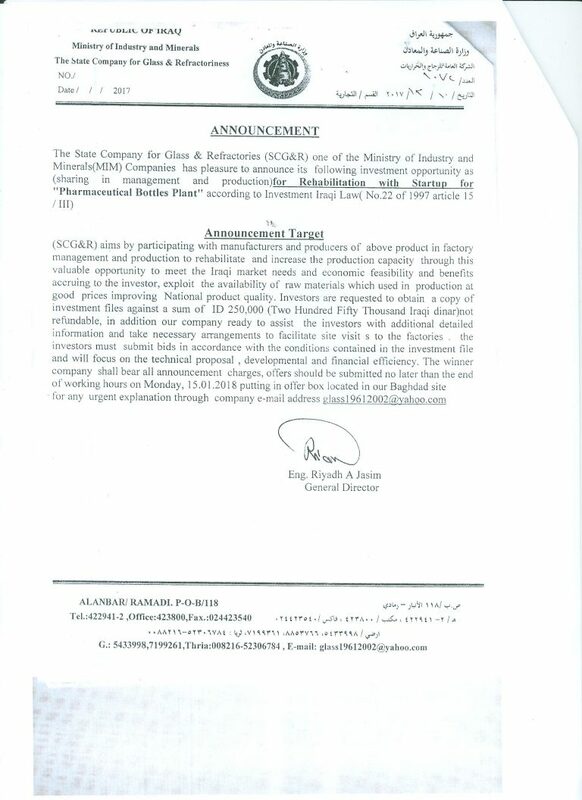 Cement plants in Kubaisa, Qaim, in Anbarand Badoosh, Sinjar, HamamAl Alilin Mosul are going through damage assessment by special committees (for the damages that occurred during 2014-2017). Iraq’s need for float glass is doubling annually. The current estimate of 1500 t/d covers the local market. The unique location of the plant is suitable for exporting this product to the neighboring countries as raw or final product. Target production capacity: 500000 t/y to be divided into two phases according to market capacity and required types. Annual production cost in full capacity to produce 700 t/d is around 94 b ID. It is possible to establish a float glass plant in Karbala and Muthana provinces. C. Rehabilitation and development of engineering plants in the Ministry of Industry and Minerals such as Al Nassir and Al SimoodCo., IbnMajid, The Heavy engineering equipment Co. (Ministry of Oil) and The Mechanical industries in Eskandariyato cover the needs of the oil & gas, electricity and heavy industries sectors for tanks, heat exchangers, valves, pipes, pumps, poles and cranes and other products the rehabilitation and development of these factories require new production lines as well as supporting infrastructure. D. Caustic Soda project/ Chlorine/ Samawa/ which includes the production of caustic soda, chlorine, Hypochlorite and Hydrochloric Acid. Cost : 40 Million Dollars. E. Sodium Carbonate project/Samawa/ produces Sodium Carbonate and Bicarbonate. Cost : 50-60 Million Dollars. Cost : 20 Million Dollars. The full 46-page document can be downloaded here. Posted in Anbar, Business, cement, Commission, Committee, Falluja, fallujah, featured, glass, Investment, Iraq Industry & Trade News, Kuwait International Conference of Iraq Reconstruction and Development, Ramadi, Samawa. Posted in Business, Commission, featured, glass, Investment, Investment Opportunities, Iraq Industry & Trade News, National Investment Commission (NIC), State Company for Glass and Refractories Industry (SCGR), Tenders. Rehabilitation & Operation of sheet glass factory. Rehabilitation & Operation of pharmaceutical Bottles factory. Rehabilitation & Operation of Ceramic wall Tile factory. Rehabilitation & Operation of Ceramic floor Tile factory. Rehabilitation & Operation of Ceramic Sanitary Ware factory. Posted in Citi, Citigroup, Commission, Construction & Engineering In Iraq, glass, Iraq Industry & Trade News, National Investment Commission (NIC), State Company for Glass and Ceramic Industries (SCGCI), State Company for Glass and Refractories Industry (SCGR), Tenders.